The IHRA and Summit Racing Equipment enjoy one of the longest partnerships in drag racing, with Summit Racing serving as the official mail-order company of the IHRA. The IHRA Summit SuperSeries, the largest and most prestigious bracket racing program in drag racing, returned for an 18th consecutive season in 2019. The $200,000 program is the World Championship for over 8,000 IHRA member-track racers each season and is held at nearly 100 IHRA-sanctioned member tracks. Summit Racing Equipment is also the title sponsor for the 16-race IHRA Summit Sportsman Spectacular, featuring the greatest value in drag racing in 2019. The partnership also includes the IHRA Summit Team Finals and the IHRA Summit SuperSeries World Finals at Memphis International Raceway. Summit Racing Equipment was founded by an avid drag racer as a part-time business in 1968. The first Summit Racing storefront opened in 1969 in Stow, Ohio, and the company moved to its first true store in Cuyahoga Falls, Ohio. Due to the tremendous demand from local drag racers and muscle car enthusiasts, Summit Racing Equipment moved to a larger location in Akron, Ohio in 1970. Expansion continued through the years in both mail order and at the physical locations with Summit Racing moving to a four-building complex in Akron in 1978. Summit moved into its current headquarters in Tallmadge, Ohio in 1992. It featured an Order Fulfillment Center, Retail Store, and Customer Support Center. In 1998, Summit Racing opened its Sparks, Nevada facility, which allowed two-day delivery to California. Two years later, Summit Racing doubled the size of its Tallmadge headquarters. In 2002, Summit Racing opened a 25,000 square-foot Retail Super Store in Tallmadge and also became the sponsor of the IHRA Summit SuperSeries. It was a banner year in 2006 with the opening of a new Order Fulfillment Center, Retail Super Store, and Customer Support Center in McDonough, Georgia, near Atlanta Motor Speedway. Summit Racing started offering landed cost delivery service for international customers in 2011. A mobile app was introduced in 2014, giving customers easy shopping from their smartphones. In 2017, Summit Racing’s fourth Order Fulfillment Center, Retail Super Store, and Customer Support Center opened in Arlington, Texas. Summit’s product line also expanded to over 1,600 manufacturers—the most ever. You can also shop online at summitracing.com, which features millions of parts. In-stock parts are shipped the same day if you order by 10 pm Eastern Time Monday through Friday. Orders arrive in just one to two days for most customers in the contiguous United States. IHRA racers and fans can take advantage of the Summit Racing Equipment SpeedCard, which features finance options of no interest if paid in full in 6, 12 or 18 months. 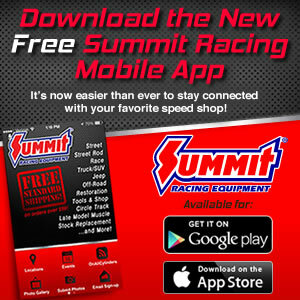 Click here to learn about the Summit Racing Equipment SpeedCard.